- Drive definitions are way off on both drives - when reading them they come up as 8 GB drives. - When I set cylinders higher to get more space, HDToolBox warns me saying that I've set an amount of cylindes that are higher than what the drive reports. - Until I set the LIMIT_4GBYTE=OFF I couldn't use more than 4 GB of the space available. - When adding enough cylinders in drive definitions to get a decent size on the drive (50 GB), it seems when using Direct SCSI + PFS3.1 I can only use up to 8 GB of the total space of the drive before PFS gives me errors and the partition is corrupted. Do I need to get the physical ROM's for the A4000 to make the IDE drives work properly? Or am I doing something wrong here? Do I need to get the physical ROM's for the A4000 to make the IDE drives work properly? Short answer: yes, that's the easiest solution. 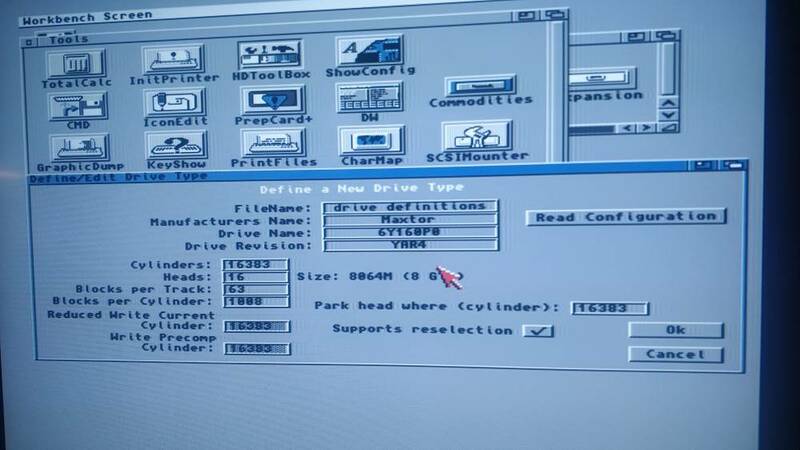 Long answer: you need an update for the IDE driver (called scsi.device). I think the new scsi.device for 3.1.4 comes as a file on the Modules disk. Once you load this with LoadModule, the larger harddrives are properly recognised. But be aware that with the LoadModule solution your boot partition must be inside the first 4GB of the harddrive (or the first 8GB with Direct-SCSI) because otherwise it cannot be read after power-on. Other partitions also can only be read after the new driver has been loaded. But this usually is not an issue unless you boot from floppy disk and need to access the hdd partitions. With the physical ROM the new driver is available from the beginning and you can use all the space for bootable partitions and all partitions are available independent of the boot device. I've ordered the ROM's so hopefully that will solve the problem. Regarding the drive definition is it enough to change the number of cylinders so the size of the drive is close to the real capacity of the drive? Or what is the best practice? It will load the driver and reboot. After that you should be able to use the "Read Configuration" button to get the real size of the HDD. Thank you Thomas. Much appreciated!